Click here to help save the bees! 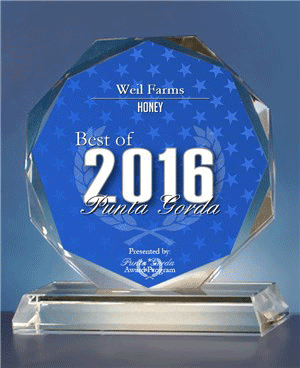 Weil Farms is located in Punta Gorda, FL, North Stonington, CT and Fishers Island, NY. Our honey bees work year round to stay healthy and happy, producing the finest honey in the world. In the winter, we send our bees up to Florida, where they pollinate the orange groves, saw palmetto palms, gallberry plants, tupelo trees, wild mangroves, and brazilian pepper bushes, as well as local fruits and vegetables. In early spring our honey bees return to New England to pollinate local fruit orchards, organic vegetable farms, and wild flowers all over Connecticut and Fishers Island, New York. All of our honey, royal jelly, bee pollen and maple syrup products are natural, and many are raw and organic. New: Honey Powder - Yummy and healthy alternative to white sugar! We do not charge handling fees. We offer a choice between USPS, FedEx and UPS. Most orders are packed and ready for shipping in 1-4 days. We reserve the right to ship the best or fastest way possible. All products are shipped from Punta Gorda, Florida. 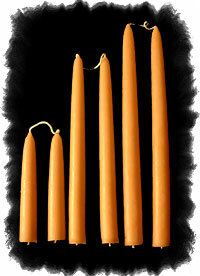 We have NY, CT, and FL honey as well as other related products. 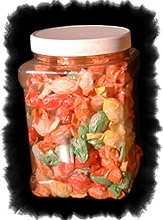 To save money on shipping, we suggest you purchase in larger quantities for a flat rate of $8.50 to $18.90. To take advantage of this offer, email us with what you would like to order at Weilfarms40@hotmail.com and we will send you a PayPal link to pay with PayPal or any credit card. This special shipping rate does not include 60 lb. pails of honey or wholesale orders. Mail order returns are accepted. Please call first before retuning any item. We do not pay postage on returned items. Click to join our FREE Email Mailing List. Fun Honey Bee Facts, New Products, Special Offers. We cherish our customers and will always protect your privacy! 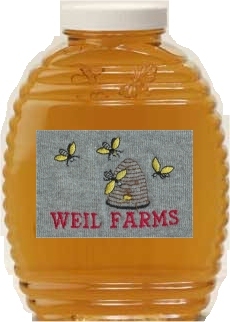 Thank you for shopping at Weil Farms!